I have a Galaxy Nexus that recently got an over the air (OTA) update to Android 4.2 (Jelly Bean). Coming from 4.1.2 I was thrilled to see the new changes, particularly with their new panorama feature. 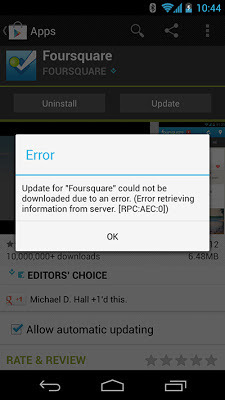 But after the update I had issues with updating apps on the Google Play Store. This would apply to any app, but for my case both Foursquare and Google Music. I tried a lot of different things from clearing the cache of each of these apps as well as the Google Play app, to even uninstalling the Foursquare app and re-downloading it. None of which worked. In the end, I found this link which pointed me in the right direction. The workaround is to simply to go to Settings->Accounts&Sync->Google and removing my Google account. Afterwards, just add it back again. Then the error message disappeared and I could update/install apps once again.